Gandhinagar, India, February 08, 2015: PRAYAG, a leading manufacturer of color and additive master batch manufacturer and STEER, a creator of materials platform technology for plastics compounds processing, today announced at a joint press conference at PlastIndia, PRAYAG’s purchase of STEER Omega platform technology for manufacturing of color master batch. 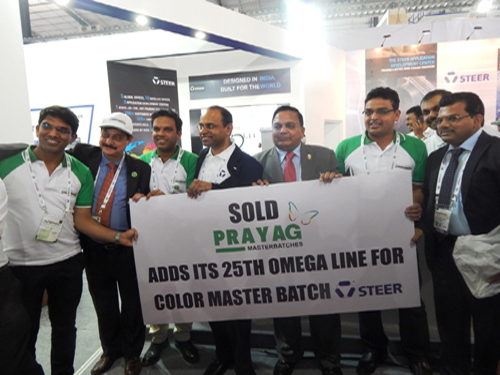 This will be the 25th Line to be commissioned by STEER for PRAYAG. STEER’s Omega 1.71 Do/Di platform technology is becoming the most preferred platform for production of color and additive master batch manufacturing of extremely high quality and consistency while providing outstanding value.